When Rain’s around, it tends to pour blood. 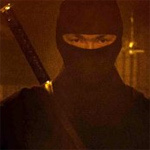 Silly as it may sound, that statement could serve as a credo for Ninja Assassin, a movie whose title promises more than director James McTeigue (V For Vendetta) is able to deliver. Rain, a Korean singer with an international profile, stars as Raizo, a young man who flees his ninja master and spends the rest of the movie running from the Ozunu Clan. That’s not a bad idea because the Ozunus tend to hold grudges. They view any deviation from the assassin’s life as a major form of betrayal. Messy and lacking in distinction, this martial arts extravaganza doesn’t measure up to its genre challenge. Blame an overly convoluted plot that experiences continental drift, wandering from Asia to Berlin as Rain’s Raizo tries to escape the wrath of his former mentor, the vicious Lord Ozunu (Sho Kosugi), who once considered the exceptionally skilled Raizo as a son and possible successor. In Berlin, a Europol agent (Naomie Harris) joins with Raizo in trying to fend off a ceaseless string of assassination attempts. Raizo and his new sidekick are constantly on the run. I know great writing has little (maybe nothing) to do with the success of a ninja movies, and we should credit McTiegue with getting some things right: The mysterious ninja clan system proves intriguing, as does the stark simplicity of Lord Ozunu’s mountain retreat, sort of a monastery of murder. Flashback scenes in which Lord Ozunu trains his youthful charges are tense, eerie and appropriately sadistic. And, yes, there’s a thrill in watching black-clad ninjas slipping unnoticed into rooms. But these hardly compensate for the movie’s rampant chaos. Much of the action takes place in the dark of night, and it’s fair to say that you may not be able to tell what’s happening. Sure, everything moves quickly, but it would have been nice to have some idea where things were headed. Too bad. What could make for a more bracing Thanksgiving than watching ninja warriors carve one another up? Now, all that’s left to do with our carefully sharpened knives is aim them at the nearest turkey. Have at it.